Dear Single Plane Golfer, Single Plane students from around the world have sent me emails and letters saying, in effect… “Todd, I can’t read another newsstand golf magazine again. They just don’t apply to me anymore…” That’s why I decided to publish the Single Plane Golfer. For years, I’ve wanted to produce a golf magazine for golfers just like you who took a chance and adopted Moe Norman’s simple swing secrets. Now, it’s finally here. You hold in your hands the only golf magazine you’ll ever need from now on. 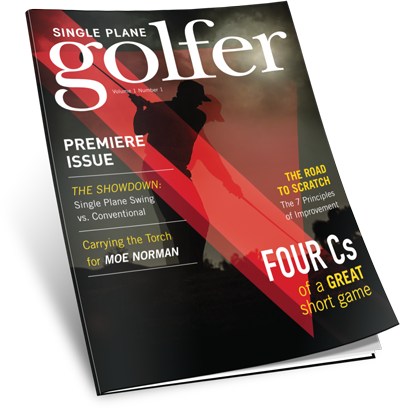 Each issue of Single Plane Golfer brings you timely articles, compelling content, and instructional material exclusively for Single Plane golfers. Every issue of the Single Plane Golfer is packed with new, cutting-edge instruction, actionable tips you can try out at the range. Get to know Moe Norman with insightful commentaries and little-known stories from the people who knew him best. We’ll even feature inspiring student profiles to keep you motivated. Discover the best Single Plane golf secrets to drive the ball for maximum distance… conquer the links like a pro… hit more greens in regulation… sink more putts in less strokes… manage any course… take the stress out of your game… and enjoy golf for as long as you play. The Single Plane Golfer © 2018 All Rights Reserved. Enter your email for FREE online access NOW!